Graham N suggested Jan 28th as a potential for a long run a while back. Since the new TB month starts on the 28th (WW1 started on 28th July) this was good news, apart from the forecast. It wasn't as bad as it could have been but it wasn't great for photos. It didn't dampen spirits though and the banter was nearly continual for the whole route making this one of the more lively TB days out. Just 4 of us: Graham, Jim, Nick and myself. 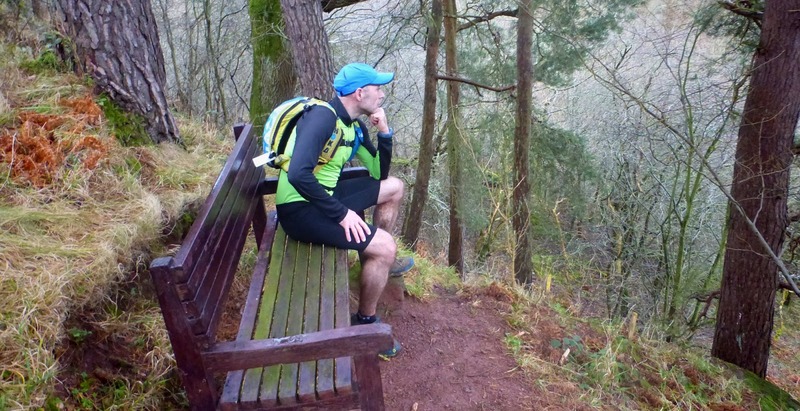 There had been proposals for more adventurous routes but given the weather and lack of daylight hours we settled on a route I suggested and Nick refined (knowing that part of the world better) to make a pretty decent run from Longniddry to Dunbar via East Linton, Pressmennan Lake and Woodhall Dean. Nick, coming from Dunbar, had to catch a bus to Haddington and run back to meet us. 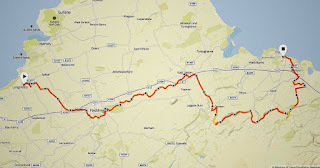 We caught the 09.33 to Longniddry and were so busy gabbing on the trail to Haddington that we didn't realise for a mile or so that we weren't on the right railway cyclepath to Haddington. We should have crossed the line and taken the dirt trail off platform 2. We went down to the road and under the tunnel. Hadn't realised they were different. Normally Nasher has the right maps laminated and a smartphone as backup. His efficiency makes the rest of us lazy and it was only when we were heading up a track I didn't recognise that I thought to switch to sat-nav mode on my watch and told the other 2 we were moving steadily away from Nick's route. By the time we got back to the proper trail Nick had phoned us from Longniddry Station wondering how he had not passed us. We (guiltily) told ourselves he would be grateful for the extra mileage, what with him signed up for the 95mile WHW in June. 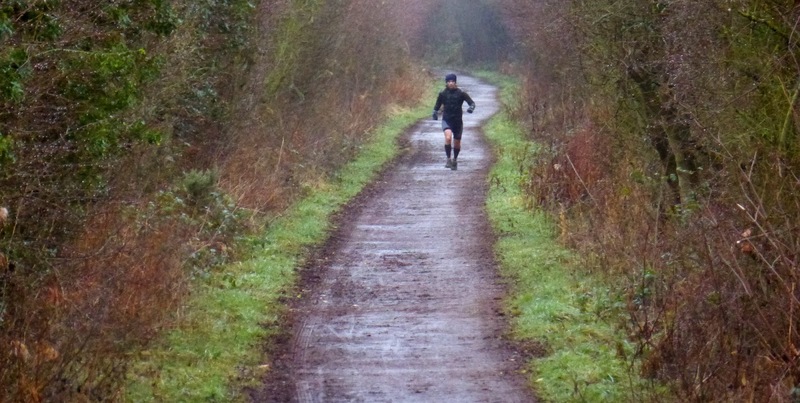 The first photo is himself running back over the trail he had already covered to meet us. Next up Haddington Cemetery, where Nick knew there was a war grave or 2 to fulfil the obligations of the Tynecastle Bronze. First Haddingtonshire casualty of the Great War, August 1914. Then off to Aldi where Jim had a poop. From there along the riverside trails to East Linton. The camera did not come out much. I took the B camera because it was going to be rainy and I didn't want to damage the good one. There was little looking attractive and worth recording although we were having a lively time of it and the running was pretty good. 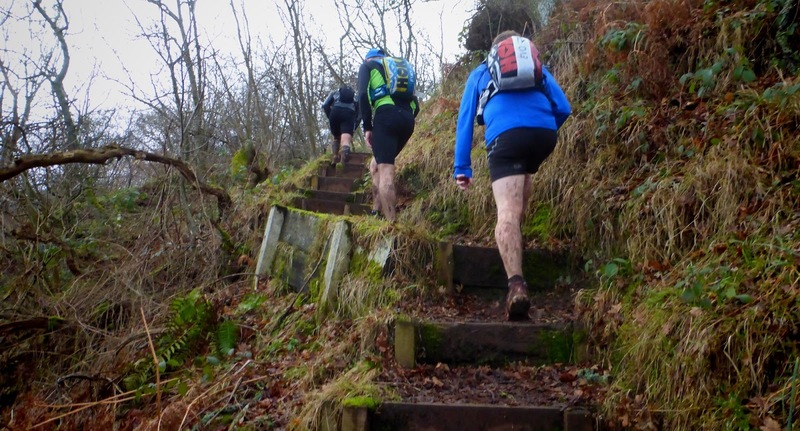 I had noticed after East Linton the route climbed dramatically and wasn't really looking forward to it. But first: a pint of Foxy Blonde in a hotel in East Linton. Delicious! Every time we are out drinking running with Graham I notice he is always first to get his wallet out. I made an effort (being unusually flush for this time of the year) to break this trend. We tried not to get too many muddy footprints on the pub carpet. I could have happily stayed for another but the rules are we must move on for the next pint; the danger being too great of remaining in the same establishment all day. 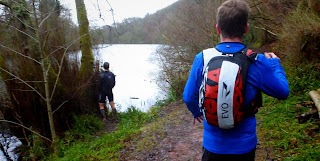 Next up a bit of uphill then Pressmennan Lake. 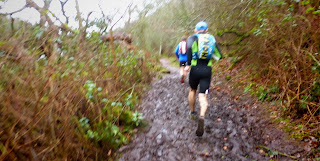 Even the delightful lakeside walk looked a bit crappy in the grey light with the waterside trails very muddy in parts. Well worth a visit in Spring and Summer. Over this gate and I made Jim laugh. 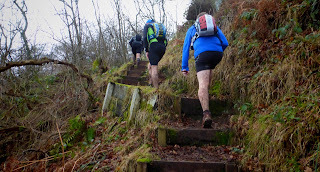 Nick had just told us that Stuart's route (a line connecting Pressmennan and Woodhall in some sort of cross country circuit) went "up that way" but involved more stiles and tricky stuff. We started across the most hideous thick black ploughed mud which stuck to the shoes as we stumbled across the uneven ground. "thank goodness we came the easy way." There was then a series of small ponds and well surfaced trails which again in the summer would be really pleasant. 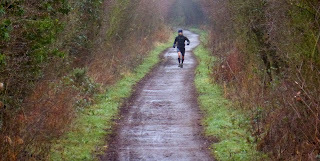 It was fairly pleasant on the run, I just couldn't work up the enthusiasm to get the camera out. I think we will defo have to repeat this route mid-summer and include the whole of Woodhall Dean. We only did a half mile or so. Hard to believe the difference. Mary and I visited it last year (blog here) and spent 90minutes walking round the 3 miles that would be hard to beat scenery wise. 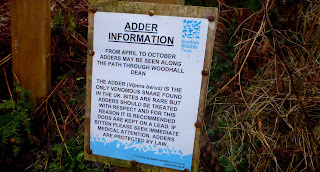 Yet today it was sodden and forlorn with muddy paths and no sign of wildlife. Apart from the snow there is little to be said for this time of year. However spirits were still pretty high and there was lots of chat. 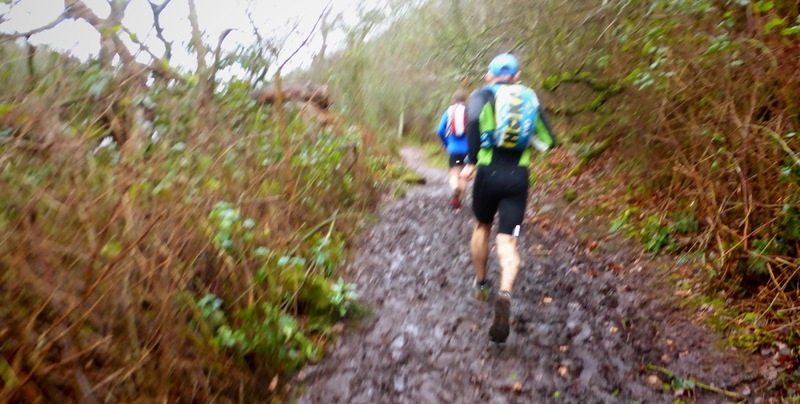 A bit more hilly stuff then on to the Doon Hill course, but in reverse. 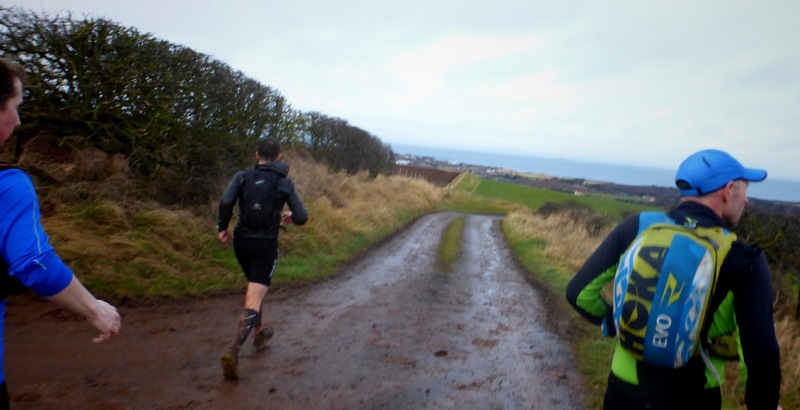 Nick had originally routed us down to the coast and back to the station but there seemed little point and if it only came to 29 miles (which it did) then I'd have the 2 station miles and Nick had the 5 extra early on. Nobody was keen to do any extra, and mention of the grapefruit (one of your 5-a-day) flavoured beer at the new Station Yard Micropub, conveniently next to the station had us keen to take the fastest route there. Just at the underpass there was an angrily barking black lab (unattended) that wasn't sure if it wanted to run with us or bite us or just have a bit of a shout. Some placatory words got us safely through the next gate but really this crap is not required at 28 miles into a long day. 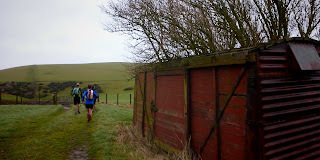 The last few miles dragged and getting to the pub was very welcome. 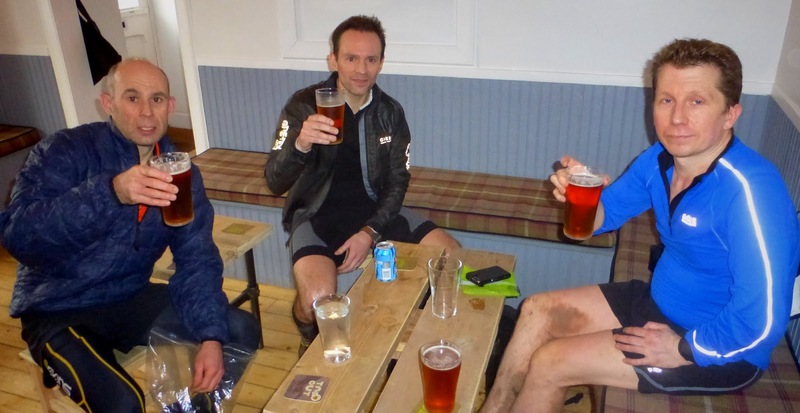 I had had the good sense to carry a change of clothes and it was delightful to be warm and dry and drinking beer. So delightful we missed the next train and continued celebrating Jim's good news there till the following train a couple of hours later. I think there were a handful of pints consumed and a "traveller" for the train. Great day's banter and full of fun. Some of the running was nice but somewhat secondary to the enjoyment!